Spencers Solicitors | Do your children practice safe swimming? A report by the Amateur Swimming Association found that nearly 1,300 primary schools didn't offer swimming lessons at Key Stage 2 (KS2) and almost half of primary school children in England are unable to swim a length unaided. Such statistics are worrying, as swimming is a potentially vital life-saving skill for children and adults alike and it is important that it remains a core ability. Therefore, I wanted to share some of my experience and offer advice on how swimming at your local pool can be a safe and rewarding activity. You may be surprised to learn that there are no specific health and safety laws for swimming pools and swimming pool operators are expected to 'make a suitable and sufficient assessment of the health and safety risks to workers and users to help decide what they must do to make their pool safe'. As there is no compulsory guidance for what every public swimming bath should have by way of safety measures, it leads to procedures being different pool to pool. • Ratio of responsible persons. 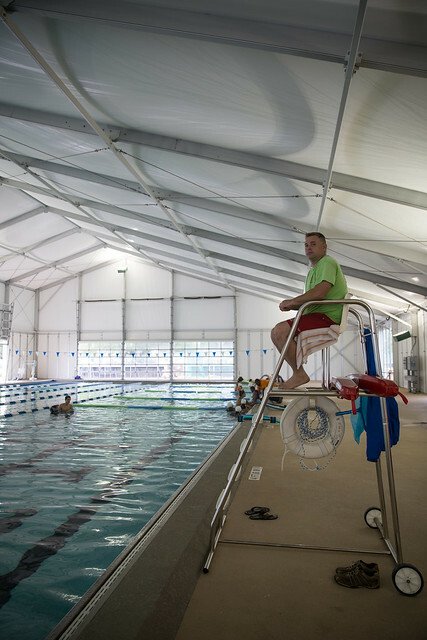 For the supervision of children, one adult to every two children may be needed in the pool. • Pool Hygiene. Shower requirements before entering the pool and any medical restrictions. • Disabled Access. Location of hoists and pool entrances. We've all seen the safety signs at swimming pools and you may think that the biggest dangers in the water are 'bombing' and 'heavy petting'! But unfortunately this isn't the case and even the most well supervised and maintained leisure facilities and swimming pools can cause injury. Thankfully drowning deaths in the UK are their lowest level since records began, down in no small part to the quality of lifeguards and staff first aid training. My children love to swim and my daughter, Chloe, is a member of the local swimming club, so trips to the swimming baths and regional competitions are a regular occurrence. The Amateur Swimming Association (ASA) recommends that a child should spend at least 25 hours in the pool to give them sufficient opportunity to learn the basic swimming skills and confidence of being around water. Given that primary schools are falling well short of this total, it could be worth sourcing your own swimming lessons. 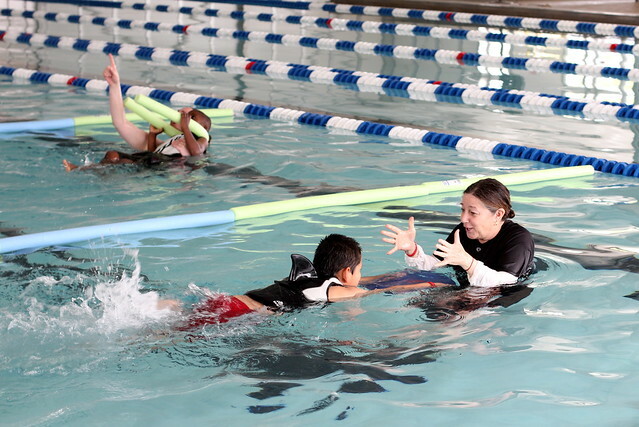 I found the best way to teach my children to swim was enrolling them in my local swim school. These junior swim school sessions generally have more supervising lifeguards, specialist instructors and buoyancy aids designed specifically with young, inexperienced swimmers in mind. A child can drown in less than 5cm of water, which is a very sobering thought. It brings home the importance of them learning this vital life skill and knowing how to stay safe whilst still having fun! Swimming is an excellent form of exercise and fun. Following this simple guidance will ensure that it is an activity that whole family can enjoy. I learnt to swim at my local leisure centre and it's an activity that has remained with me as an excellent form of exercise. Being safe in and around water is not only a vital life skill for children.....if you can't swim it's never too late to learn! Do you have any tips on safe swimming? Please share them in the comments.